In today’s digital society, it would seem that paper copies of confidential material would be drastically reduced – but that is simply not the case. Hard copy printing has actually drastically INCREASED – primarily due to the ease of printing multiple copies, faxing documents to remote locations, transferring digital files via networks and the printing of the same documents in multiple locations. The digital age has also provided the tools necessary to gather more confidential information with relatively little from which to start.Combine this with the multitude of available storage methods for confidential material – hard drives, floppy disks, CD’s, DVD’s, PCMCIA cards, Zip disks, etc.- and it’s obvious that conventional methods of confidential material destruction are simply lacking in capability and security.Much more than a “paper shredder,” the Vecoplan Single-Shaft Rotary Shredder provides more security than conventional cross-shredding in a single pass with a single machine – a single machine which is also capable of securely destroying virtually EVERY IMAGINABLE media of confidential information storage. 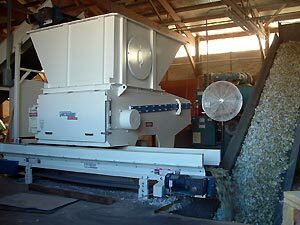 Unlike conventional shredders which require a two-step process for cross-cut consistency, the ReTech cross-shreds in one pass offering variable and consistent shred size through interchangable screens. 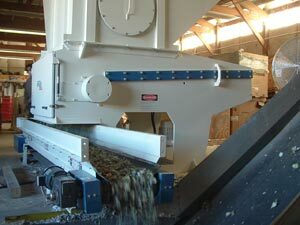 Binders with metal rings, entire security containers, even full bales can be dumped into the ReTech Rotary Grinder with no pre-processing.